Dr. Swapnil Hiremath is inspired by his patients to uncover the truth behind medical dogma. For example, he played a lead role in busting the myth that contrast dye should never be used in medical imaging in people with serious kidney disease. He is also searching for practical solutions to help people with hypertension lower their blood pressure. Eating less salt does reduce blood pressure, but people often have trouble changing their shopping and eating habits. Dr. Hiremath is leading a clinical trial to test whether consultation with a dietitian and weekly follow-up phone calls can help. 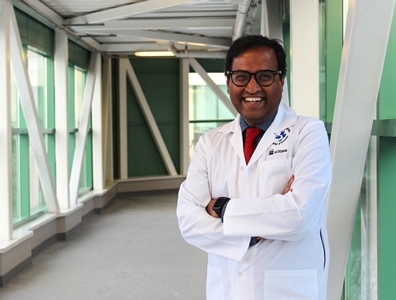 An author of over 100 papers, Dr. Hiremath is passionate about connecting with kidney experts and countering health misinformation on social media. He co-founded the twitter-based journal club #NephJC. These twice-monthly twitter chats regularly attract 60-100 kidney specialists from around the world to analyze research articles and discuss current practice. Dr. Hiremath was recently appointed as an associate scientist in the Clinical Epidemiology Program at the Ottawa Hospital Research Institute. He is a staff nephrologist at The Ottawa Hospital and an associate professor at the University of Ottawa. “A lot of the research I do is contrarian. I like to test common knowledge to see if it holds true,” said Dr. Hiremath. Research at The Ottawa Hospital led by scientists like Dr. Hiremath is possible because of generous donations to The Ottawa Hospital Foundation.